Injured as a Pedestrian? It's Time to Lawyer Up - BJE Law, P.A. The dangers of car accidents all well publicized and understood, but the dangers to innocent pedestrians are often forgotten. About 6,000 pedestrians, people walking next to or across a road, are killed by automobiles, and another 110,000 suffer injuries. 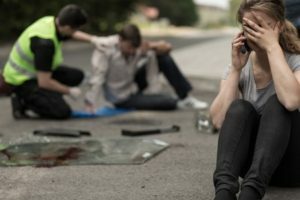 Though laws in every state are written to protect pedestrians by allowing them to have the right of way when crossing a street, distracted drivers have the potential to crash into people the same way they crash into other cars. Fortunately, our country’s legal system allows pedestrians who are injured in car accidents to seek legal compensation for their suffering. Fault plays a major role in the potential for a pedestrian to bring up a lawsuit against the car who injured him. If a pedestrian dashes across a busy highway when oncoming cars have a green light, the car that hit him cannot be considered at fault unless there is an extenuating circumstance which proves that the car could have stopped, but did not, like texting while driving. On the other hand, if a pedestrian is hit while crossing a “GO” stop walk, the driver is definitely at fault. Most states require drivers to carry auto insurance, so it is most likely that the auto insurance will cover compensation costs. Many pedestrians can even file an auto insurance claim even though they weren’t driving during the accident. However, if the driver is uninsured and has no real assets, there is no way to obtain the money needed for compensation. When seeking compensation, pedestrians are typically eligible to receive support for past, present, and future medical expenses related to the accident, reimbursement of past, present, and future lost wages due to injuries, and financial compensation for pain, suffering, and loss of enjoyment of life. Since pedestrian accident cases can become rather complex—especially when more than just a pedestrian and a driver are involved—it’s best to turn to an attorney to seek compensation. ← How Safe are School Buses?